Saturday, May 19, 2018 - official opening day for the 2018 season. The official opening day for the 2018 season..
One of Edmonton's premier attractions, the Park represents four distinct time periods, exploring Edmonton's development from a fur trade post in the vast Northwest, to a booming metroplitan center after the First World War. 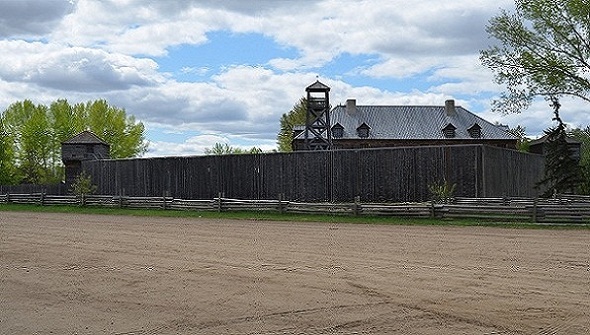 The park features over 75 structures many of which are the original buildings. Costumed interpreters abound on the site and live the way of the past. Exploring each building, each room, and talking to the "inhabitants" makes for an extremely enjoyable recreational visit. This attraction can be viewed in a few hours or may take many return visits to appreciate the sense of the past. There are 4 distinct historical time periods. Maps of each period have been included for navigation ease..
Each building has photos of the exterior as well as the interior. Click on the gallery thumbnails for a larger photo. The picture galleries on this site represent over 100 visits to the park from 2000 to 2015. I hope you enjoy viewing the pictures and appreciate the uniqueness of this attraction. To see a larger size version of a photo just double-click on the thumbnail image. This is just a hobby photo website and is not affiliated in any way with the City of Edmonton, the Fort Edmonton Foundation or Fort Edmonton Management Company. Just an attempt to help promote one of Edmonton's finest attractions in my special way. Click the balloon photo to view some of the proposed future plans for the Park. As you will see, this website is a huge undertaking and as such will be updated in sections over the next while. Updates will be listed here when they are finished. The Fort, 1885, 1905 and 1920 Streets, the Midway, Train and Streetcar photo sections are now finished. Enjoy!